Elcomsoft Wireless Security Auditor | Elcomsoft Co.Ltd. Réalisation de l’audit de sécurité de réseau sans fil Wi-Fi, vérification de la charge des réseaux sans fils et des chaines. Utilisation des adaptateurs Wi-Fi spéciaux ou types pour la « mise en écoute » du trafic sans fil et l’attaque des mots de passe WPA / WPA2. Intercepte le trafic Wi-Fi limité et continue de travailler hors-ligne. Supporte: mots de passe pour WPA et WPA2-PSK, AirPCap et adaptateurs Wi-Fi types, accélération GPU à l'aide de cartes vidéo d`utilisateurs. Elcomsoft Wireless Security Auditor is an all-in-one tool to help administrators verify how secure and how busy a company’s wireless network is. The tool will attempt to break into a secured Wi-Fi network by analyzing the wireless environment, sniffing Wi-Fi traffic and running an attack on the network’s WPA/WPA2-PSK password. Featuring patented cost-efficient GPU acceleration technologies and employing a range of smart attacks targeting the human factor, Elcomsoft Wireless Security Auditor runs a highly efficient accelerated attack on the network for a pre-defined amount of time in order to test how secure your wireless environment is. A single weak link poses a valid security threat to the entire corporate network. Wi-Fi networks can provide sufficient security if configured properly and accompanied by an adequate password policy. Elcomsoft Wireless Security Auditor identifies and exposes security problems in your wireless network to allow network administrators taking appropriate measures and adopting a proper password policy. If one of your network workstations is compromised and a malicious person gets network access to at least one system, it may not even be necessary for an attacker to be physically close to the wireless network in order to obtain full access to data sent and received. A password hash is normally stored in the Windows Registry, and can be retrieved remotely for off-line analysis. Elcomsoft Wireless Security Auditor can simulate attacks from the inside by automatically importing saved password hashes as retrieved by Elcomsoft Proactive System Password Recovery. This kind of attacks allows determining how secure your wireless network is to insider attacks. Elcomsoft Wireless Security Auditor comes with a custom NDIS driver for 32-bit and 64-bit systems (Windows 7, 8, 8.1 and 10). The driver is digitally signed by Microsoft, and can be installed on all compatible versions of Windows including the latest builds of Windows 10. By automatically intercepting Wi-Fi traffic and performing an attack on selected Wi-Fi networks, Elcomsoft Wireless Security Auditor becomes a one-stop solution for auditing Wi-Fi networks. WinPCap drivers are required to enable Wi-Fi sniffing. The WinPCap driver is included with Wireless Security Auditor. In addition, Elcomsoft Wireless Security Auditor fully supports dedicated AirPCap adapters provided that the correct drivers are installed. Elcomsoft Wireless Security Auditor examines the security of your wireless network by attempting to break into the network from outside or inside. Elcomsoft Wireless Security Auditor can work as a wireless sniffer or operate offline by analyzing a dump of network communications. The tool attempts to recover the original WPA/WPA2-PSK passwords in plain text. 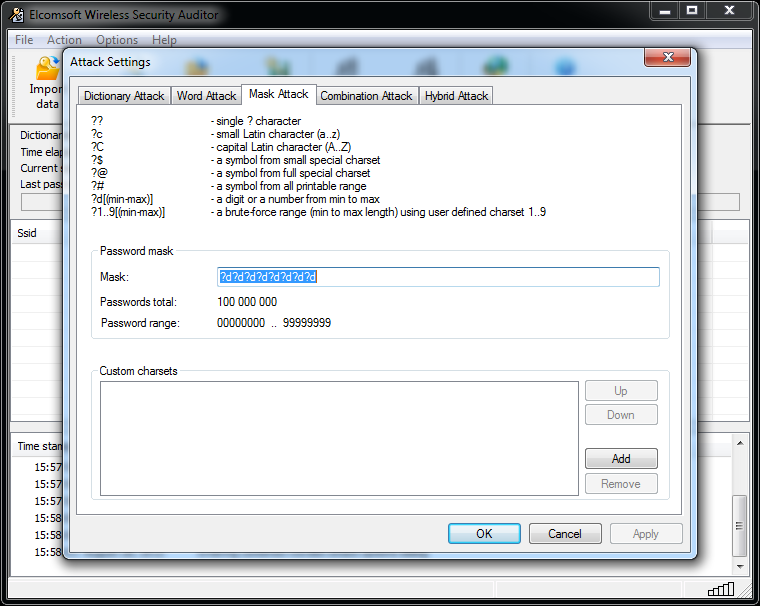 Elcomsoft Wireless Security Auditor allows carrying out a password audit within a limited timeframe. Representing state-of-the-art in password recovery, Elcomsoft Wireless Security Auditor is one of the fastest, smartest and most advanced tools for recovering Wi-Fi passwords. If Elcomsoft Wireless Security Auditor fails to recover a Wi-Fi password within reasonable time, a real attack would similarly fail. Elcomsoft Wireless Security Auditor integrates a custom NDIS driver for 32-bit and 64-bit Windows systems (Windows 7, 8, 8.1 and 10), and automatically installs the required WinPCap drivers. Most modern Wi-Fi adapters are supported. Drivers are digitally signed by Microsoft. Tcpdump support: the tool can use a standard tcpdump log produced by a third-party Wi-Fi sniffer. In order to audit your wireless network, at least one handshake packet must be intercepted or discovered in the tcpdump file. AirPCap support: Elcomsoft Wireless Security Auditor supports AirPCap adapters, and requires proper drivers installed.